Throughout this portfolio I tried to document my understanding of news literacy, however, here are a few examples to fulfill the JEA initiative being evaluated. About: Recently BoonePubs.com pushed out their first online In-depth feature issue focused on social media. I created the back page that consisted of the dos and donts of social media. Conducting research on external sources I wrote an intro for the infographic to provide the reader with quick facts. 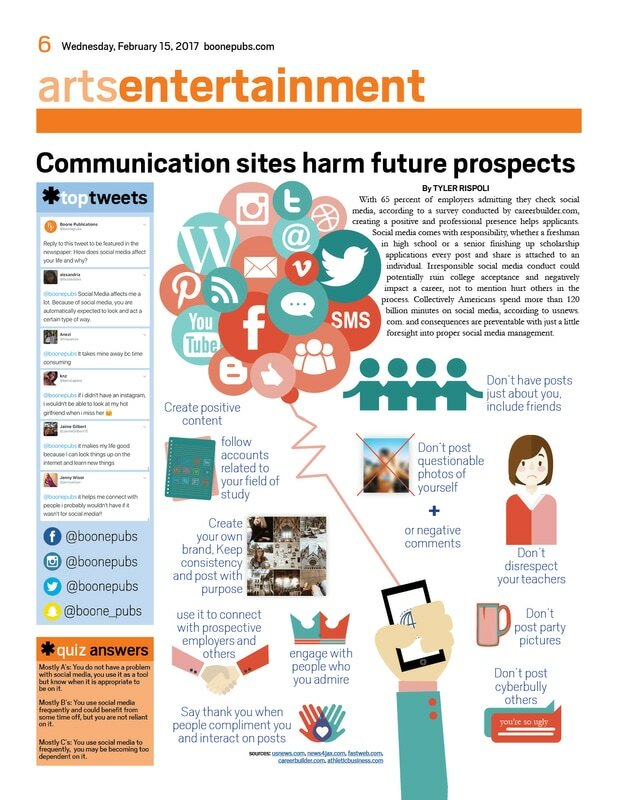 Then I focused on splitting the dos and donts of social media into an inforgraphic. Read the full issue here. Using copyright free music from American Music Co, a site paid for and approved by our district, I shot and edited the video below. I focused on five of the eight news values: timelyness, prominence, proximity, human interest and significance. The event covered the first Pi Day event from Boone's Animal Rescue Club. About: A car drove onto our campus in spring of 2016 and since then other security breaches are posing threats to our campus. Recently our Principal, Dusty Johns, sought looking for money to improve our campus security because our district wasn’t doing anything. In this story I focused on what happened in terms of security and what Johns’ future plans were. My interview with Johns went great, but after sending questions to our district security advisers, they rejected an interview. I didn’t stop though, I wrote the story and modified my angle to point out what improvements were coming this summer. I hope students read this and know change is coming to our campus. After three lockdowns from January to March of 2017, a car driving onto campus in spring of 2016 and surrounding bomb threats, Principal Dusty Johns, alongside Orange County Public Schools, called for a security update. “I feel we certainly know where there is room for improvement and we are working closely with district leadership to fulfill a plan to enclose our campus in the coming months,” Johns said. 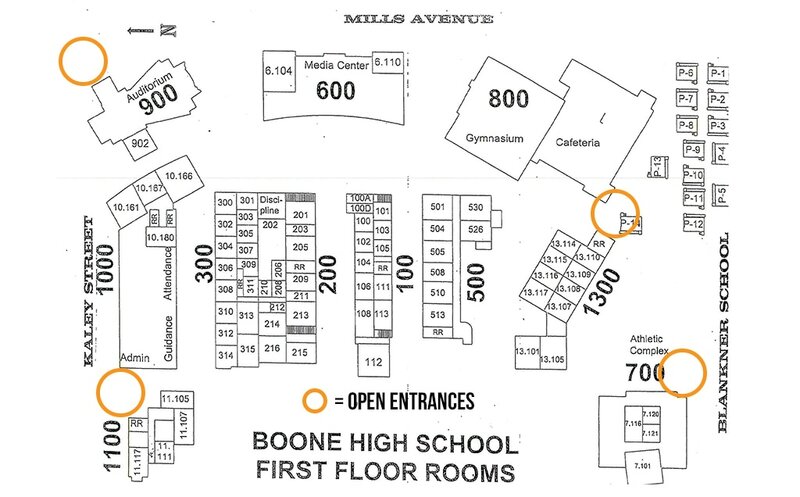 In summer of 2017, Boone will receive capital renewal money for campus renovations. These renovations will include: new roofing, ceilings, air conditioning units, exterior paint, windows, doors and locks. While not in the original plan, Johns pushed for a portion of the funds to supply updated fencing, gates and surveillance cameras. “What I do find comfort in is that we know where the gaps are so we know we have to have adult supervision to compensate for those key areas,” Johns said. ​Around the perimeter, four entrances points are accessible to the public. One at the back gate of the junior lot, one at the parking lot entrance gate, one at the main office and one at the theatre parking lot. “I think admin is strict in all the wrong places, we are enforcing headphones and a dress code policies daily, but ignoring patrolling the many entrances around campus,” senior Gavin Capenos said. In spring of 2016, a mentally ill man drove onto campus through the gate at the south end of the school. He proceeded to get stuck and pinned his car between a snack machine and pole outside the gym. Since then, OCPS didn’t make any immediate physical security changes because of funding. At this time OCPS would not comment on the situation, citing security reasons. “This incident could’ve been avoided with a gate system that did not allow students to enter without being identified and granted access. We are looking to install something like this within the project coming up,” Johns said. After OCPS did not add a gate to enclose this entrance, Johns sparked dialogue with OCPS security personnel and prepared a resolution. Johns keeps parents informed of lockdowns and security threats as they happen. “I think we are on the right track. I think we are getting to the point in which my ‘robo-calls’ are no longer causing panic and parents understand that I’m going to be transparent and consistent with safety measures. I want my voice to bring a sense of calm and assurance that we are putting safety first and erring on the side of caution,” Johns said. Improvements are scheduled for the summer of 2017.